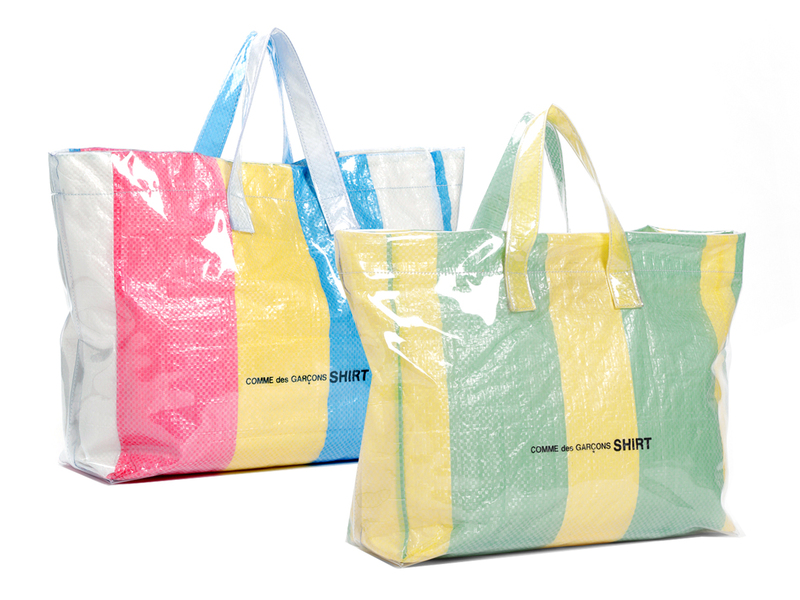 Comme des Garçons has done it again by releasing an all-new version of its popular PVC-coated tote this June. This time around, they’ve created a wider version and removed the shoulder strap, giving it a ‘shopper’ look and feel. Gone is the crinkled paper and in its place is a material that’s reminiscent of your favourite IKEA shopper, one that’s sandwiched between a PVC exterior and a cotton interior. Each tote comes in at 45 cm wide and 38 cm high, and will be available in 2 colour schemes that reminds one of a typical Asian woven market bag. The first is a striped red, yellow and blue, and the other comes in a mix of yellow and green that’s equally eye-catching. Made in Japan and finished with a slip pocket in the interior to keep everything neatly organised, this is definitely one-up on the previous crinkled paper variation. Available now at the Comme des Garçons boutique at Hilton Hotel, the Comme des Garçons Shirt Multicolour Tote is priced at just SGD190 each. And because we checked, while we know you might be able to buy this tote online at a slightly lower price, once you add the shipping (and the waiting time), you’d still be better off heading to the boutique along Orchard Road and getting it pronto.